This is a professional Soken start-up, smaller volume machine with twice the speed, designed specifically to seal all types of cardboard, including biodegradable packs. A cut out on the machine heater plate protects the pack window and product from heat damage. It has an accurate digital temperature controller, which can be set to accommodate a variety of cardboard coatings. A specialist coated top plate ensures printed board is sealed without damage to the board surface or print information. Ideal for sealing: Sandwich wedges, baguettes, tortilla wraps, salad and pasta boxes. Ideal user: Smaller shops, start-ups, lower level non-automatic production. 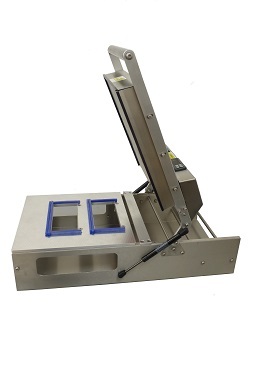 This heat sealer’s ability to seal cardboard packs with a wider and longer seal area, enables two packs to be sealed simultaneously for some sized packs. This hand operated, hinge action machine uses an accurate digital temperature controller to ensure you get the same results every time. It offers precision film cutting with the added benefit of providing a wider pack option which can offer a half gastro catering pack. Easy to operate, its compact stainless steel design is ideal for table top, small operation set-ups. The wider packaging option gives greater flexibility. Interchangeable packaging plates are available to suit your packaging requirements. Ideal for sealing: cardboard sandwich packs, salad packs, bloomer boxes, tortilla wrap boxes, baguette boxes. Ideal user: cafe’s, bakeries, deli shops. 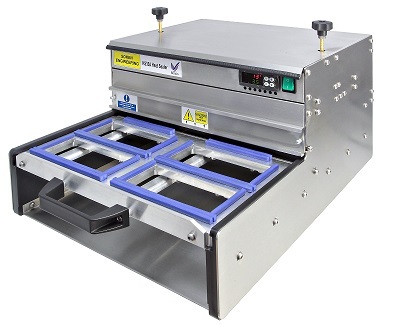 This Soken semi-automatic, higher volume heat sealer. It is manually fed, then seals automatically, using a high-pressure compressor. It can seal up to 4 packs simultaneously, with minimum effort, while providing optimum seal integrity. Incorporating technology adapted from Soken high-speed, linear automatic sealing machines, it provides an adjustable seal time, temperature and pressure to suit your requirements. Versatile, it can accommodate a wide variety of different cardboard packaging. So, if you change your packaging, we can change your tooling plates to suit. It’s fast, flexible and efficient. Incorporated into the design is the ability to also seal blister packaging. Ideal for sealing: Sandwiches, baguettes, pasta and salad boxes, tortilla wraps and noodle boxes. *Optional bespoke stainless trolley available for ease of movement and incorporating storage for multiple tooling. This Soken new, semi-automatic, higher volume, quiet, all electric power sealing system. Like the 35AC, it seals up to 4 packs, simultaneously. It is manually fed, then seals automatically using Soken patented electric drive system. Minimum effort required, and delivers superb results. With virtually no sound, it is ideal for all environments, especially when compressed air is not permitted. Incorporating technology adapted from Soken high-speed linear automatic sealing machines, it provides an adjustable seal time, seal temperature and pressure to suit your requirements. Versatile, it can accommodate a wide variety of different cardboard packaging. So, if you change your packaging, we can change your tooling plates to suit. It’s fast, flexible, efficient and very, very quiet. Incorporated into the design is the ability also to seal blister packaging. Ideal for sealing: Cardboard sandwiches, baguettes, pasta and salad boxes, tortilla wraps and noodle boxes. Ideal user: Mid-range users, safety sensitive locations, i.e. airports. HS52 – Linear automatic, rapid, high volume, cardboard heat seal machine with indexing system for large scale production. 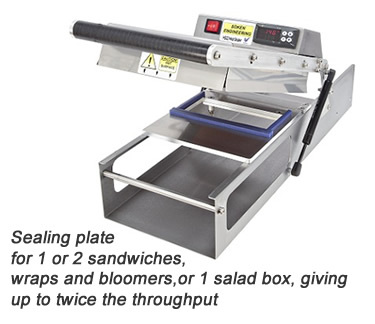 The Soken HS52 delivers high-speed production with a sealing rate of up to 1400 sandwich packs an hour. It provides consistent, reliable and efficient results. Key to its impressive performance is an accurately controlled high-temperature seal system and consistent pressure, together with a precision indexing system. This combined system, has the ability to seal the very latest biodegradable cardboard packaging in a variety of sizes. 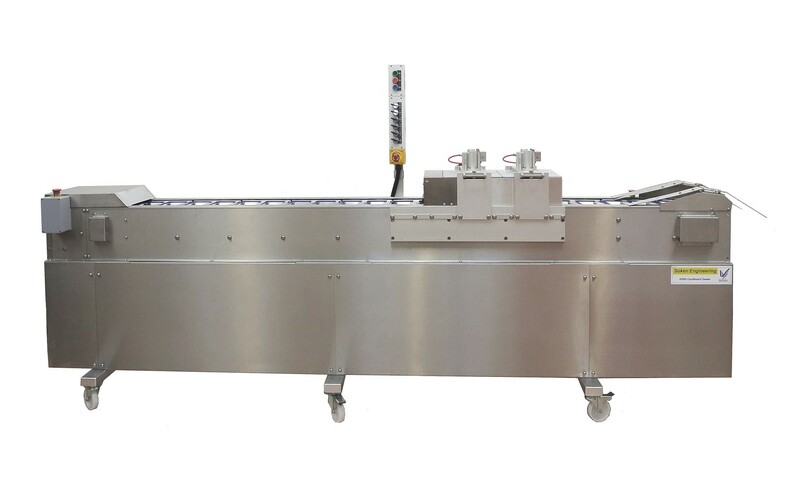 This a high volume machine, linear automatic, rapid action, twin-head line delivery system for heat seal packaging production. 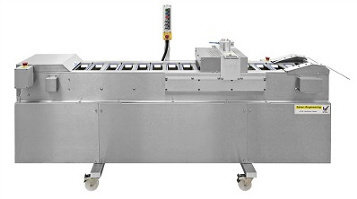 It delivers on all levels with an impressive sealing rate of up to 2600 sandwich packs an hour, achieved through a twin head sealing system. The rapid high-pressure sealing rate is maintained at a consistent level, providing exceptionally efficient production with reduced labour. protects the product from excessive heat during the sealing process. A unique tooling design maintains accurate positioning of the packaging, for precise sealing. Guarantee: All Soken machines come with a 1 year guarantee for both parts and labour. Sealing plates can be made to suit your changing packaging requirements. Many types of cardboard packs available. As we manufacture our own products, all spares are held in stock, ready for next day despatch.